If You are a Newbie and not able to earn some bucks a day Then This Tutorial For You.Bear in Mind That,Time is money.As much time you will give as much will you earn.You may be heard that Autopilot.Yes,Today I will show you a method that You can earn Via Manual Work Or Autopilot.Though,Earning and Banking depend on You. Got some free time and thought to help out some newbies.Hope You will be helped ever you're a guest to this site.I don't how much clear is my thread is but I did my best to show you everything and process to make everything easier. What Is Link Shortening Website? → A Website From where You can Shorten a Long URL (Example:www.facebook.com/posts/sbdfdskfskdhfksdhfskdhfksdhfkhskbf) To a Short URL (Example:www.example.com/pppp) . And When You Promote the Shorten Link,You will be paid.And They Will Pay in CPM Based ( Per 1000 Views). Why You Should Work On Link Shortening Website? →Because If You Make a Website Manually Then It will cost you money and beside you need to make backlink and On & Off Page Seo.So,IT's Better To Earn With them.No Investment.Directly Earn From Website. So,Another Question comes,Which is the best Link Shortening Website and Which is Legit.I have selected one and working with them.I Won't recommend You a Bad Site.So,Scroll down and check my earning statistics and payment proof. You Can find many other features when using their website.Now Need to earn with them.Before Started to earn money You need to Join or Register on PaidGator.To Register Click Signup or Login to view earning guides for mobile apps and websites..If You Have done the Registration process then You Can Login From Signup or Login to view earning guides for mobile apps and websites..No Need any E-mail Activation. After You Log in,You will see your Dashboard.In Left Menu You will See a Option named as New Shorten Link.Click On That.A box will appear.Put any URL You want.Then Click Shorten.Now You will get a Link. 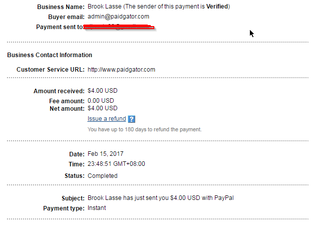 (Example: Paidgator.com/pppp) .Now You have to Promote This Link To Earn. Create a Fake Account on Facebook or go with Real Account if you haven't any problem.Enter in as much groups as you want.Specially which is open and have no approval system.When Searching a Group use keywords- Song,Latest Song,Song Lover etc. Join In all Groups that You have got in result.Now Share Your Link That You have got from Paidgator.Beside You need to send some friend request daily to make Your FB Account Popular too.Try To Make a Facebook account with female information basis.Don't start to send friend request randomly. Log in Youtube.And Search For popular Song.Now Copy The Popular Video Song URL And Put that in to PaidGator and Get a Short Link.Now Share the Short Link into the another popular video.Write something with the Link such as - Download This Video Song or Wiz Khalifa's New Song.Just Don't write Download Mia Khalifa's Video :D .Post in 10 Videos daily.You Will Get Some Visitors. It's Easy.Just Put the Link On Any website You want.You may working on several Forums like TBN.Just Short Your Link And Share the Shorten Link on other Forum Website.In Forum Website You Will Get Much Traffic Then Method 1 And Method 2.Better To Choose a Forum which isn't subject to Making Money.Because They Don't Allow Shorten Link.Try TO Find Some Forums which subject to Fashion,Website Making or any off-topic. I Have tried This Method Myself And Earned Decent amount of money.So,Why You Can't.Just the Problem is You Don't stick with for a time.REMEMBER THAT,There is no method that an make you rich overnight.Just Stick With this Website and Follow the Method.In a few days,You will see You Are Earning Money in autopilot. If Your Average CPM Is Low then No Problem.They Show average on NET COUNT.That's Mean,If Your Last Link Visitor is from India and India's CPM is 0.80$ then It will Show 0.40$ as default.So,No Need to be Disappointed by watching less Average CPM.Just Have a Look on Your View.